Boeing Research and Technology Australia (BR&T-Australia) says having its Brisbane-based staff working at its new facility at the University of Queensland will help spur inspiration for new ideas in aerospace. Some 30 research and technical staff have moved into the BR&T-Australia Technology Centre located at the University of Queensland’s St Lucia campus research hub. Boeing said in a statement it was the first time Boeing had co-located its research arm within a university in the Asia Pacific. The University of Queensland site, which was officially opened on Monday, features a “high-tech student interaction display area complete with augmented-reality technology, computer labs and collaborative spaces”. 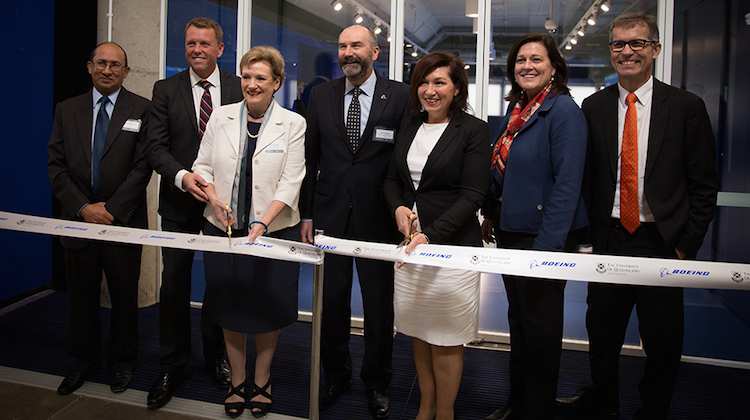 “The opening of this centre on campus brings together Boeing and UQ researchers who will collaborate on the next great advances in aerospace,” Boeing Australia, New Zealand and South Pacific president Maureen Dougherty said in a statement. Boeing said BR&T-Australia would work together with University of Queensland researchers and students in areas such as engineering, human movements, neuroscience, chemistry, physics and psychology. “Projects earmarked for investigation include studies in unmanned aircraft and autonomous systems, aircraft simulator technologies, manufacturing technologies, and cabin disease transmission,” Boeing said. University of Queensland vice-chancellor Professor Peter Høj said BR&T-Australia’s move onto campus “dramatically boosts opportunities for our creative researchers and talented students to engage with a global innovator, and to explore opportunities to collaborate and work with industry”. “Boeing has partnered with UQ for more than 13 years and gained a strong appreciation of the quality of UQ staff, students and graduates,” Høj said. Salute to UoQ for achieving and accepting the privilege, and deferential bow of honour to Boeing for offering it. The ‘high-tech’ student interaction area sounds like an all-round interesting tourist attraction for aviation enthusiasts and the general public as well. The cabin disease research is an interesting angle; something I’ve wondered about ever since my childhood when I flew >50 international flights. I remember being last off the plane several times in my youth and seeing the cabin crew walking down the aisle with their disinfectant sprays. School classrooms and office buildings are also at significant risk of disease distribution in their overcrowded spaces (arguably the two greatest causes of disease distribution in developed societies), so the disease research will have generalisable value aswell. With aircraft frequently flying as high as 40 000 feet. Any work proposed on repeated exposure to cosmic radiation. Flight crew and cabin crew could wear tags similar to radiographers to monitor the exposure.